Future versions of VMware Site Recovery Manager (SRM), now in development, will include host-based replication, automated failover, planned migration capabilities and more. I saw early versions of new VMware SRM features at the beginning of 2010, and the company provided a few more details about the future of the product at VMworld 2010. But keep in mind that VMware's presentation doesn't guarantee that particular features or functions will turn out exactly as described when they become generally available. Future versions will build upon and expand VMware SRM's already firm foundation. Let's review some of their features. An eagerly anticipated VMware SRM feature is host-based replication. This capability will allow customers to replicate virtual machines (VMs) from one location to another without the need for third-party, storage array-based replication. It should interest customers who run vSphere in branch offices but still need to protect their VMs. The target market will be the small and medium-sized business (SMB) sector, where expensive storage arrays and array-based replication are beyond most budgets. For large enterprise customers who already have EMC MirrorView or NetApp SnapMirror, this enhancement will unlikely change the way they use SRM. But host-based replication may still interest some enterprise customers, depending on their needs. Even in a large enterprise, it's unlikely that every site will use the same array vendor, so there is a case in which host-based replication could offer protection between dissimilar arrays. VMware hasn't been publicly said how this feature will affect the way SRM is packaged and sold. The current pricing and licensing arrangements pitch VMware SRM firmly and squarely at the enterprise market. For host-based replication to gain traction in the SMB market, VMware will have to change its SRM SKUs. Host-based replication in VMware Site Recovery Manager will likely be protocol neutral, which would be highly attractive to customers migrating from one storage protocol to another. For example, it should allow replication between Fibre Channel and Network File System (NFS) storage, similar to the way VMs move around with VMware's Storage vMotion. Protocol-neutral host-based replication is possible because it just interacts with the data store. It doesn't matter if the storage is local, a Fibre Channel or iSCSI storage area network or NFS. The virtual appliance behind this replication doesn't interface directly with the storage protocols that the host sees. Instead, the host-based replication appliance communicates to an agent on the host, which then transfers data back to the appliance. This setup may be very attractive in the SMB market, where direct-attached storage is more prevalent. Host-based replication will be enabled in the VM properties, rather than the storage array. And it will likely ship with a vCenter plug-in to enable VM protection with host-based replication on the menu, as seen below in a VMworld 2010 slide. The host-based replication process may provide insight into the future of storage array-based replication. Host-based replication is fully VM aware, which means its server is aware of the VM's logical layout. This setup allows the administrator to pick and choose which of the VM's virtual disks to replicate. Right now, array-based replication duplicates the entire VM at a block level. In the future, as storage arrays become even more VM aware, they will have that level of granularity. But the host-based replication feature will have it from day one. New VMware Site Recovery Manager features: pros and cons Setting up host-based replication should be relatively straightforward, and I'm hoping it will have a similar feel to the VMware Data Recovery backup system. Users would choose the destination location for the virtual disks and a recovery point objective, then supply an initial copy of the VM for the first sync. After that, the replication should ship only delta changes across the network to the recovery site. As with any new feature, there will be some limitations. For example, host-based replication protects but will not replicate powered-off VMs (although, they are powered off, so they shouldn't accrue changes, anyway). Also, host-based replication cannot protect some VM types, such as templates, linked clones used by VMware View and VMs enabled for Fault Tolerance. And there isn't support for the new automated failback process or "reprotect." But users will be able to carry out manual failback steps. 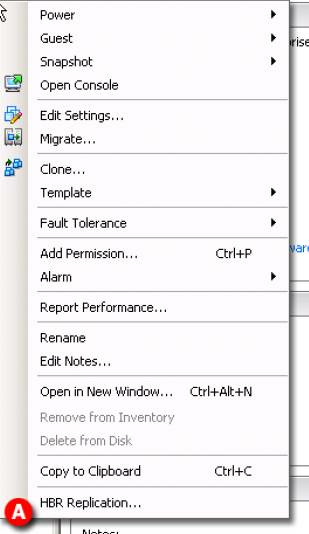 Part two covers more unreleased VMware Site Recovery Manager features.